Lisa Heydlauff is the founder and director of Going to School, a creative not-for-profit company that makes design-driven stories, books, graphic novels, games, APPs and television series, to teach the poorest kids on the planet entrepreneurial skills at school. 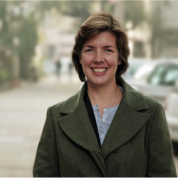 Lisa has lived in India for 16 years, she’s a Young Global Leader of the World Economic forum, an Ashoka Fellow and Ted Fellow. Going to School’s flagship project, Be! an Entrepreneur is 35 stories that teach children entrepreneurial skills that’s being implemented at scale in 1,300 secondary government schools across Bihar and Jharkhand, reaching 150,000 kids in Grade 9 every week. Going to School stories have been incorporated in national curriculum reaching 10 million children every year and their movies air on national TV reaching 100 million people.